Vandenberg Air Force Base, California. December 6, 2013. 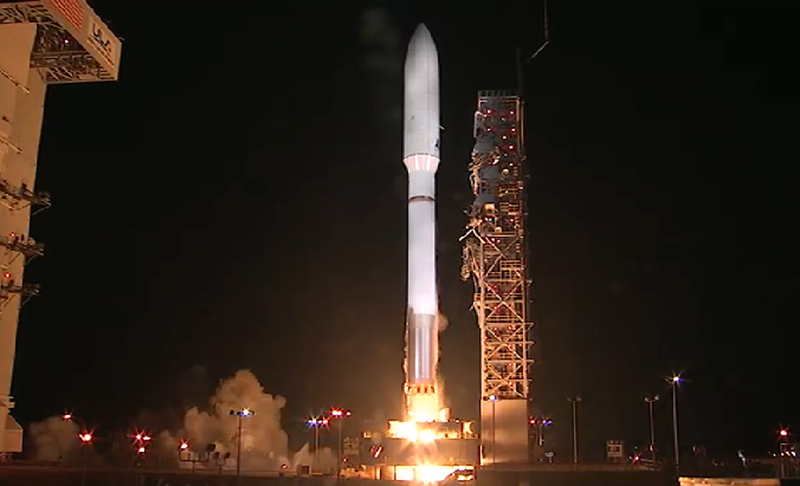 A United Launch Alliance (ULA) Atlas V rocket carrying a payload for the National Reconnaissance Office (NRO) lifted off from Space Launch Complex-3 on December 5 at 11:14 p.m. PST. Designated NROL-39, the mission is in support of national defense. This mission was launched aboard an Atlas V Evolved Expendable Launch Vehicle 501 configuration vehicle, which includes a 5-meter diameter payload fairing. The Atlas booster for this mission was powered by the RD AMROSS RD-180 engine, and the Centaur upper stage was powered by a single Aerojet Rocketdyne RL 10A-4 engine. In addition to the NROL-39 payload, the Government Experimental Multi-Satellite (GEMSat), consisting of 12 CubeSats, took advantage of the Atlas V launch vehicle ride share capabilities and were deployed following completion of the primary mission. The NRO and ULA partnered to develop an AFT Bulkhead Carrier (ABC) on the Centaur upper stage, which is a platform for accommodating auxiliary payloads aboard Atlas V missions. The CubeSats were developed under a sponsorship of both the NRO and NASA. The Aerospace Corporation, the Air Force Institute of Technology and the Army developed the seven NRO-sponsored CubeSats. The five NASA-sponsored CubeSats were developed by Montana State University, California Polytechnic State University, the University of Michigan, and Medgar Evers College of the City University of New York. “We are pleased we could support the NRO, NASA, and all of the associated institutions by successfully delivering these important auxiliary payloads which will test and validate new technologies for debris mitigation, propulsion, space weather, communications, on-orbit data processing and the use of commercially available components,” said Sponnick. Developed by the United States Air Force to provide assured access to space for Department of Defense and other government payloads, the commercially developed EELV program supports the full range of government mission requirements while delivering on schedule and providing significant cost savings over the heritage launch systems. ULA program management, engineering, test, and mission support functions are headquartered in Denver, Colorado. Manufacturing, assembly and integration operations are located in Decatur, Alabama, and Harlingen, Texas. Launch operations are located at Cape Canaveral AFS, Florida and Vandenberg AFB, California.